Nearly two years into its launch in Bengaluru, Sodabottleopenerwala recently introduced a new menu for the first time. Keeping all its favourites intact, such as Dhansak, Berry Pulao and Paatra Ni Machi, the updated list includes lesser known dishes that are equally exciting. We made our way there one afternoon, surprised to find the place quite busy, despite it being a regular weekday. 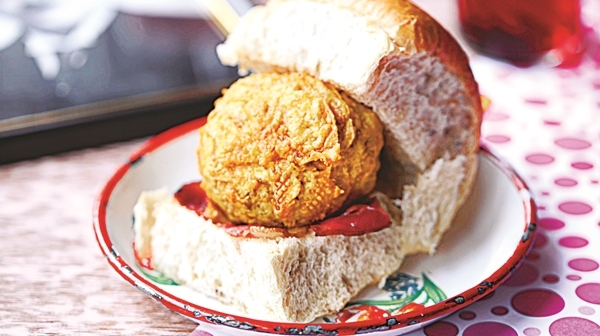 From the a�?All The Good Thingsa�� section, our pick was the Bacon Vada Pav. Giving the traditional street food favourite a decadent twist, the bun is grilled with bacon fat and the vada includes a generous addition of bacon crumbs. The potato and bacon work rather well together and the fat gives it an extra edge. Though part of the Mains, Tarela Rainbow Trout is perfect to be shared as a starter. The Himalayan trout is baked, rather than fried, with aromatic Parsi spices and served with tomato and mint relishes. A word of caution though… watch out for fine bones. A definite must-try for seafood lovers, the Parsi Style Jumbo Prawn was the highlight of the meal. Marinated in tangy spices and cooked to perfection, it came with a little kullad of fiery gravy made with coconut milk, and a helping of steamed Basmati rice. A little lighter on the palate, the Squid Prawn Patio is a mix of the two seafood favourites with a tomato-based masala thata��s both sweet and sour. We recommend you pair this dish with a portion of their flaky malai parathas, made by mixing the dough with fresh cream. The flatbread has a distinct taste and when paired with all the tangy goodness, ita��s a match made in heaven. We also sampled the Paneer Sanju Baba, said to be a personal recipe of actor Sanjay Dutt himself. It features soft, pillowy paneer cubes cooked in a slightly sweet onion gravy, which is garnished with khoya and almond flakes. Though best teamed with their pav, it also worked quite well with the malai paratha. Their dessert section is not to be ignored either. Coffee obsessives must not miss the Matunga Coffee Cake. Though it does not sound too exciting, it sure does not disappoint. A Parsi version of the tiramisu, the dessert comes in a traditional, stainless steel filter coffee drip maker. It brings together coffee mousse and coffee cake with a dash of kahlua and bitter coffee decoction. Use the accompanying crispy wafers to dig out the bitter-sweet, gooey mess for a power-packed caffeine kick.